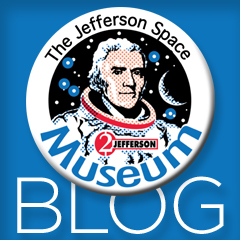 In late September, 2008, retired astronaut John Young conducted a private signing at Novaspace Galleries in Arizona for space memorabilia collectors. He graciously agreed to pose with the flown Jefferson from his mission, which bares his signature from the period. It was a rare opportunity to orchestrate this reunion between John Young and this "stow away" extra passenger on Gemini 3!